Good Time to Buy a Home? 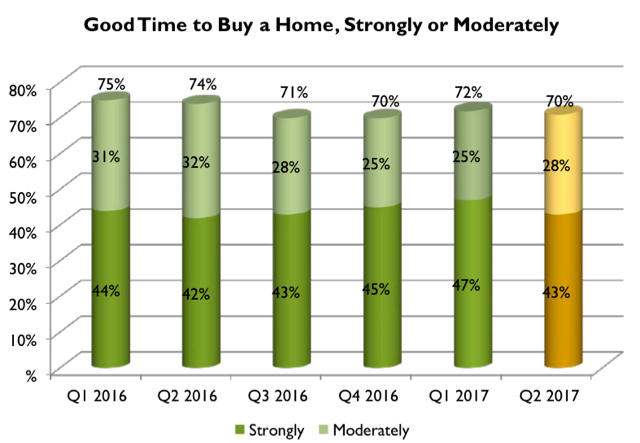 In the second quarter of 2017, 70 percent of people believe that now is a good time to buy a home. Forty-three percent believe the strongly, a decrease from 47 percent in Q1 2017, but similar to one year ago at 42 percent in Q2 2016. Only 30 percent of people believe that now is not a good time to buy a home. Across all groups surveyed, the majority feel that now is a good time to buy a home. Not surprisingly with rapid home price acceleration, those who are currently renting or living with someone else, those who are under 34 years of age, and those who live in urban areas are less confident that now is a good time to buy. More than three in four people who currently own a home, those over 55 years of age, those wth incomes over $50,000, and those in the Northeast, Midwest, and South believe that now is a good time to buy a home, which is a slight increase from Q1 2017.